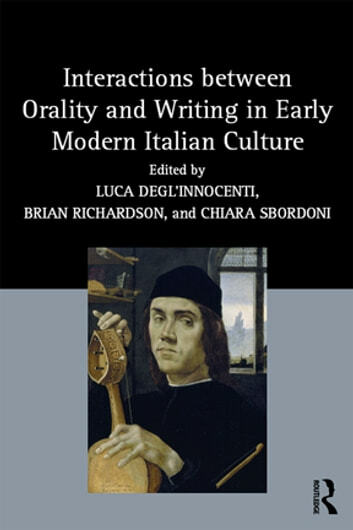 Investigating the interrelationships between orality and writing in elite and popular textual culture in early modern Italy, this volume shows how the spoken or sung word on the one hand, and manuscript or print on the other hand, could have interdependent or complementary roles to play in the creation and circulation of texts. The first part of the book centres on performances, ranging from realizations of written texts to improvisations or semi-improvisations that might draw on written sources and might later be committed to paper. Case studies examine the poems sung in the piazza that narrated contemporary warfare, commedia dell'arte scenarios, and the performative representation of the diverse spoken languages of Italy. The second group of essays studies the influence of speech on the written word and reveals that, as fourteenth-century Tuscan became accepted as a literary standard, contemporary non-standard spoken languages were seen to possess an immediacy that made them an effective resource within certain kinds of written communication. The third part considers the roles of orality in the worlds of the learned and of learning. The book as a whole demonstrates that the borderline between orality and writing was highly permeable and that the culture of the period, with its continued reliance on orality alongside writing, was often hybrid in nature.